Do you have a render you can post. The OpenGL shaded preview doesn't show all the shading effects like displacement. Plus you may have the option for transparency turned off in the Interactive Renderer. Also, I don't think that's the shader for the model as the textured view in the assembly room shows there is an image map applied, yet the color channel and all the other channels show no indication of texture maps. More than likely there is more than one shading domain. 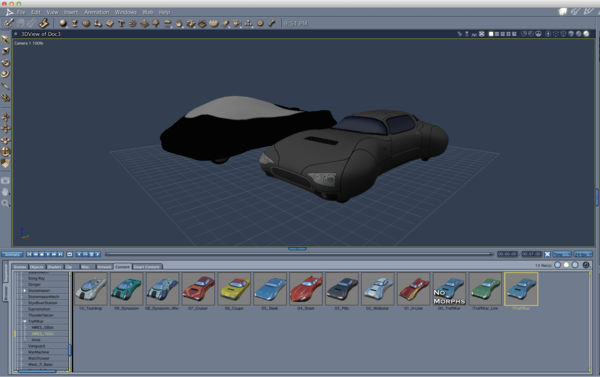 To check, select the Model from the car in the Instances palette, then select the shading tab at the top of the screen. If there is a multi-colored ball and a list of domains below, then it is multiple domain model. If there are issues, then you will need to look at each shader to fix it. You can simplify the process somewhat by consolidating duplicate shaders under the Edit Menu. 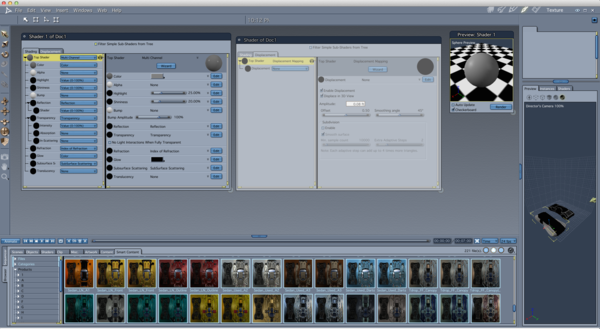 Select Edit--> Remove Unused Master--> Consolidate Duplicate Shaders. If you go back to the shading domain, you will notice that some shaders are in mutiple domains, so editing on will edit all the domains with that shader. Get to that point, shoot some new shots... we'll get your kars looking sweet! Right ep? Also, thanks for sharing this. I might just have to pick that up. Looks like a cool product! We'll get his cars speeding right along in no time! And effects he didn't even think of yet. None of those are renders, though. It helps to see what happens when it's rendered. Things can always look funky in working view. 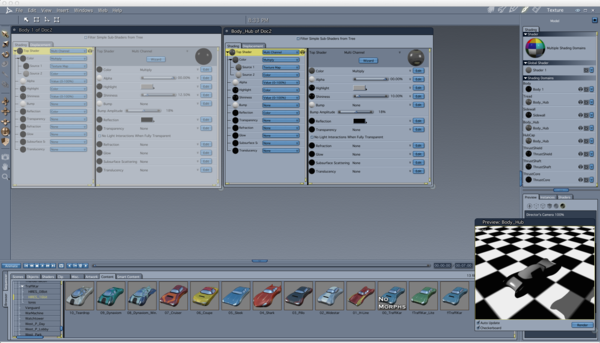 Also, the only shader that you are showing us the window of is "Shader 1", which doesn't seem to be part of the car, just a placeholder for the group. Look at the Texture room images you've put up above. See the list of shaders off on the right side panel? Double-click some of those. 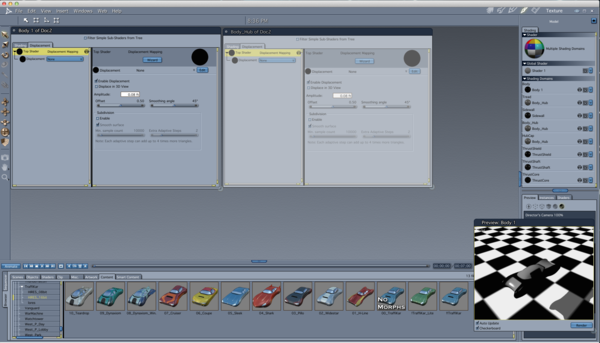 Also, say like that top image with the string of cars, go to the render room (filmstrip looking icon upper right corner) and make sure that the camera in that view is selected in the middle tab. 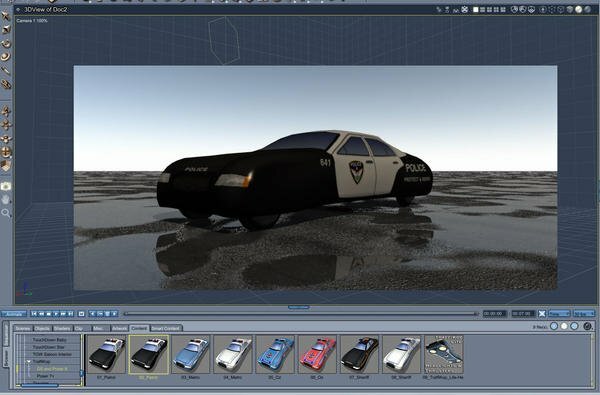 Then, in the bottom panel along the lower part of the screen, click the Render button, save and post that image along with a screenshot of one of those shaders - like the main body shader of one of those cars. You'll see... we'll get it straightened out for you. In OpenGL, which is the regular working view, we often lose a lot of the actual details of the texture. Who knows... they might be somewhat okay. But first we need to see some setting so we can show you better how to really tweak them to be nice. If I didn't already over-spend... I'd get the TraffiKar and show some examples... but alas... that must wait for some time. 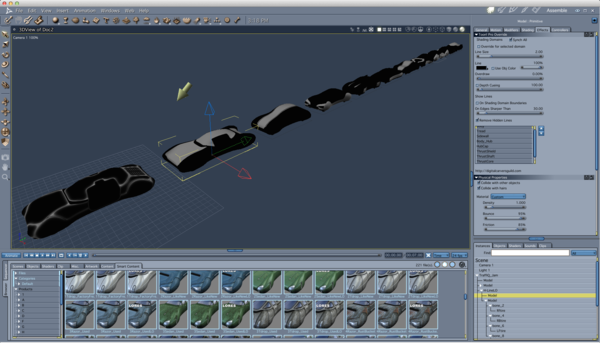 So, if you look at the hierarchy of the car, there are two models. The one without the triangle is the geometry, the one with the triangle is the first "bone" in the rig for the car. The second issue is that the shader you're bringing up- Shader 1 isn't the one you need to look at. You have a multi-domain shader, so to see what's happening, you need to look at one of the shaders in the domains. To do so, select one of the shading domains, such as, Body or, Tread and double click it to open the shader for that domain. 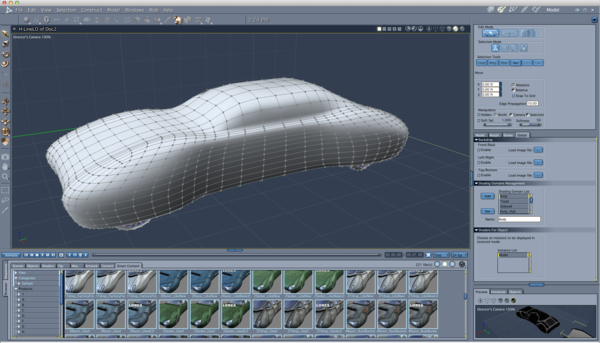 The shading and render engine in Carrara is different than Poser's, so not everything loads right off. Texture maps that Carrara sometimes misses are specular maps. I also wouldn't be surprised if it missed displacement maps. Speaking of displacement and since it was mentioned earlier, Carrara's displacement can be finicky. If there is displacement maps that you want to use, load the map in the displacement section of the shader and then slide the little brightness slider below the map's thumbnail down to 1% or 2% and increase it from there. The other option is to load the map into Carrara's bump channel and see if that gives the desired effect. The bump channel in Carrara is pretty good, but it doesn't alter the geometry. It's basically an optical illusion, unlike displacement which does alter the mesh. Dartanbeck, you've beaten me to the punch for the last time! Wait! It's MY turn to use Vader's voice... remember? 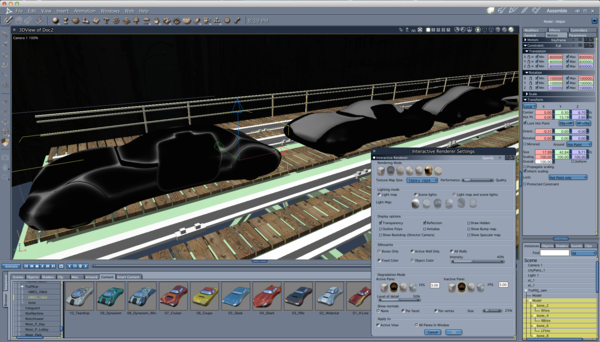 Wow, ok, all good stuff, so here, a shot of the body and body_hub shaders, one of the texture maps being used, the displacement tabs, a render of the cars in a quick and dirty thrown together scene for contrast, and then finally since the topic has come up a couple times, the settings I have for the interactive renderer, work your magic? :-p Thanks as always of course. A couple ideas and a question or two. The multiplier in the color channel can be ditched. It's a very simple process. Drag the Texture map channel up to where it says Multiply. See if that does anything. I also notice there is no image map in the bump channel or any other channel except the color channel. If you hover your mouse over the name of the image map in the color channel, Carrara will show the file path to the image map. You can use the name of that file to find bump, specular, alpha and displacement maps for the product if they exist. Now for my question or two. Does the product come with .mat files? These would change the color of the car, rather than the shape. I noticed in your screen shots that it looked like you had morphs or poses selected in the Content Browser. 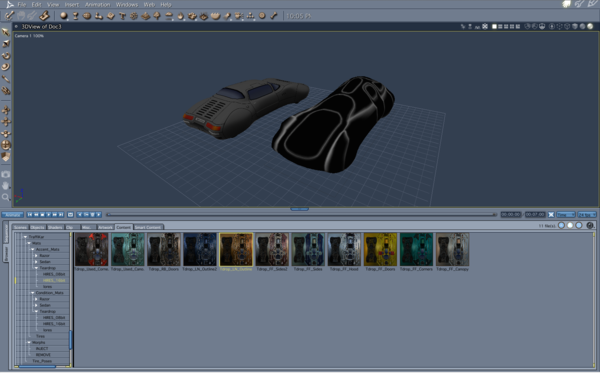 If you do have material files, they would be under Poses in a traditional Poser style runtime. If they're there, have tried any of them? Is this an item from DAZ or somewhere else like Renderosity? I may be able to get a better idea of what I should look for, even if it's from a promo. It may take a bit, since I don't have the product, but I have some hunches, based on the excellent new images. I've reloaded one of your images here to avoid confusion. First, let's look at the color channel on the left-most window in this image. See how there's an image map multiplied by a color? Well the map being used is called "Sedan Accent" or something similar. This leads me to believe that this product makes use of DAZ Studio's ability to layer textures. We can do that too, but it will take a little bit of explaining. So the next step is to locate the texture folder for the product. This is located in the folder where you installed the product to, and then: Runtime > Textures > xxxx, where "xxxx" is either the name or initials of the artist, the name of the product, or something like that. If you've installed it manually, just open that zip again and drill down into the textures folder, as mentioned above, and find out the name of the next folder inside. If you've used DIM, locate TraffiKar in the Installed Tab, right-click on it and have it show you the list of installed files. 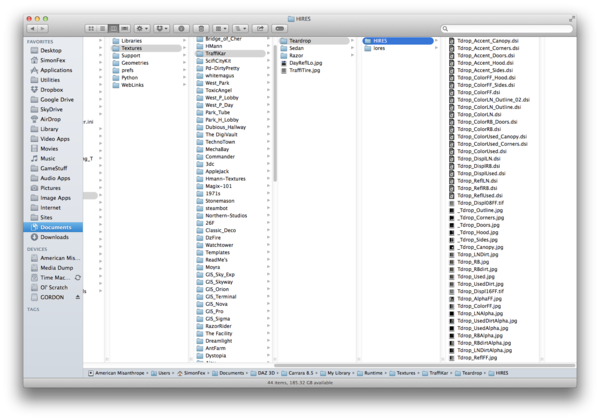 What you're looking for is the name of the next folder after Runtime > Textures. This is the important part. I think this product uses and overall appearance that is always present in DAZ Studio, and by activating the material presets, it changes layers or adds layers to that present appearance. So what we need to do is to find the texture map(s) for that base appearance, and add it to the shaders. From the looks of it, we need to do this for each of the shaders in the car. Try to find image whose file names are similar to those that are already loaded in the color channel. But that may not be the case, since it has so many different looks. So perhaps something similar to the shading domain that holds the shader that you have open. Base_Car_Tx might be an example name. Find something like that, like Hull_Base_Tx (or whatever) that has the overall look of a car instead of something like the image in the color channel I've attached here. You might even need to experiment, if the names aren't clear. But I'd be willing to bet that the texture maps will be, somehow, very clearly labeled. The color channel says Multiply and has source 1 and 2. Keep the Source that has a map, and change the other one to Texture Map. In the upper of the two folder icons of that new Texture Map Source, load in the map we were just looking for. So even though the shaders may have something else for Bump and Highlight, change them each to Texture Map, if there is an appropriate map for that channel. If you don't see maps for Bump or Specular, just ignore that for now. Keep and eye out for other Suffix, like Glow or Illum. Some artists include these extra maps to Mask areas to glow. If you see these, they go in the Glow channel of the appropriate domain shader. This may all sound very confusing, simply because there's a lot to discuss. So I'm going to stop here and let you ask/report more stuff on what you find. Like I said... we'll get this fixed for you. You may even be able to load the Kar into DS and Save As a character file. This might get your shaders closer to where they need to be. Then open that new file in Carrara and have a look. I found the product page and there's Poser and DAZ materials. I would try the Poser mat files first if you haven't done so. Dart's explanation is good, but if the Poser loads better it may be less complicated as far as layering shaders goes. I also notice from the product description that there are a few map types that probably won't load in either version, such as the reflection map and displacement maps. In some rare cases the alpha map hasn't loaded for me by default, but those have usually been freebies where the artist maybe didn't do something right. You may not need to mess with the reflection maps as the reason they were made was because in the good old days Poser couldn't do reflections. Carrara can, but there needs to be something to reflect. As I suggested earlier, I would try loading the displacement map into the bump channel instead of the displacement channel at first to see if it gives you the desired results. If not, then put it in the displacement channel at low settings to start with. Ok, so I have some screen grabs of (hopefully) all the stuff you guys are looking for. Also apparently I found a lo res... what I guess is a reflection map on the last trap there, so I guess that's supported in all of this? Again I'll try to actually mess around with this stuff tonight after work, but in the meantime I figured this would help? Thanks guys! While you're having a look at the textures and just absorbing some of my last post, I have to go and play Warhammer 40 today, so I'll be back. But I'm noticing all the stuff I was talking about here. 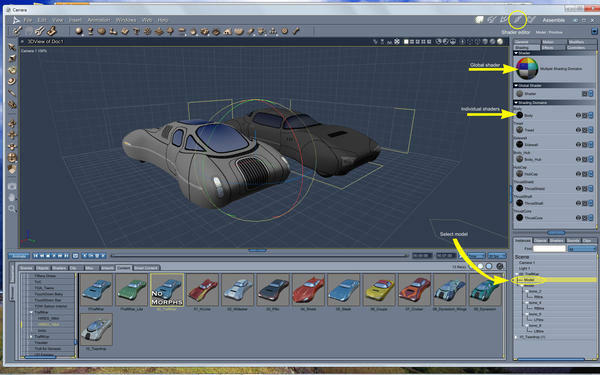 Without actually heading back to some of your earlier screens, I'm guessing that the TearDrop, Sedan, etc., are the major 'shapes' variations that you can load, and that those texture folders are used for those cars. Inside TearDrop texture folder, the second image down, above, we see all of those different textures. The ones toward the top of the list look (at first glance) to be those that I was talking about - the main, overall shaping textures. And I have a feeling that those alpha masks might be used to help paint the other textures into the correct zone. If that's the case (the part about the alphas) we'll have to set up our layer mixing diferently than 'multiply'. Truthfully speaking, I was planning on taking us away from multiply right from the start, but the earlier instructions were really just a starting point, anyways. Replace the existing Texture Map from Color channel Source 1 with the corresponding jpeg, according to which part the shader is for. I believe that the suffix on the texture's name corresponds to the shader domain for that part. A lot to digest - especially if you're new to Carrara shaders. This will be a bit more advanced than the average Poser/DS to Carrara material conversion, so shaders after this will become second nature. But this is a really cool feature to have in a product... all these different ways to mess around with the appearance... really cool! Work on that for now, and when I get back from my game day, I'll instruct you further on how we can use those extra 'dirt' and 'alpha' maps to add age and use to your cars, easily and flexibly. Very cool. Oh, and the tiff image above all of the jpegs is used as a displacement map. Please realize that this part may not be a simple drop in and done affair, but might require a bit of work on our part. Play with it, if you like (Displacement channel, change 'none' to Texture Map' and load that in), but it will likely have too strong of a displacement at the default displacement, in the settings that are available in the main displacement channel. If you do experiment with this, lower the displacement value way down, and make sure to enable 'show in 3d view' and subdivision and stuff. But I recommend just leaving displacement out for now. When it comes down to it, though, I might actually be wrong with those jpegs being the correct maps, and it might be those with the FF suffix? Hard to say from afar, but it will be easy for you to see the changes as you experiment. The reflection map can be used to work, if you wish to. But using a Value 1-100 shader in your reflection channel will give you realistic reflection according to what's surrounding the model. We'll get into that and the other channels later. For now I'd just like you to figure out which maps can be used in the color channel to make the car look like a car. Wow... I really want this thing now! Oh... and where I was referring to the sedan_lo_Accent map in my earlier post, those are maps found in the Sedan textures folder. It's really nice to have this much flexibility in changing the appearance of a car in one product. If my wife lets me, I'll see if I can buy it and we can work together. Content Browser--> Runtime--> Pose--> Trafficar. Now the Trafficar listing will probably have a little triangle next to it to expand it. The sub-directories may look like: Mats, Morphs and Tire Poses. If so, you will want to select Mats, which also looks as if it may have some nested diractories, such as: Accent Mats, Condition Mats and Tire Mats. From there, there may aso be some nested directories to display the high res 16 and 8 bit versions and the low res versions. The pngs in your screen shot are the thumbnails linked to the .pz2 (Poser) and .ds (DAZ Studio) files. 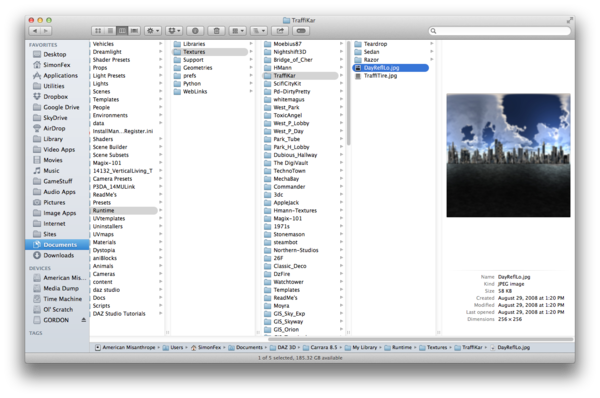 Hopefully the thumbnails indicate a Poser Mat file vs. a Studio file. 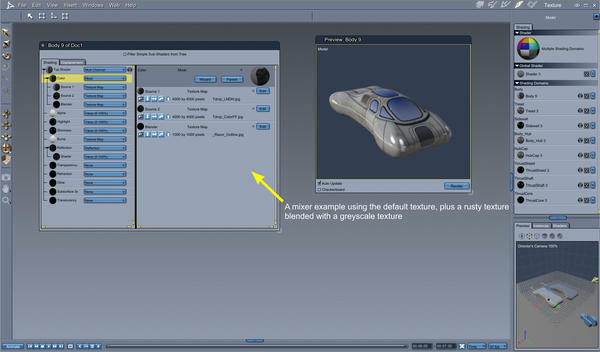 To use the Poser .mat files, select the top level of the car in the instances palette on the right side of the screen, then double click the icon for the mat file you wish to apply. Weight a moment or two while Carrara loads the file. If you're in textured view, you should see the color change. 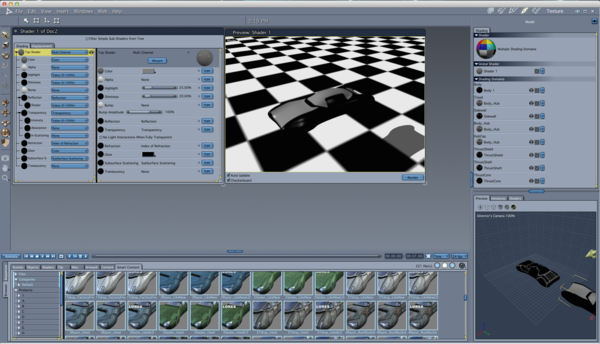 If the car seems to be missing details or the shader looks off, then you will need to open the shaders to look at them. As Dart mentioned above, it's easier if you go to Edit--> Remove Unused Masters--> Remove Unused Shaders, then Consolidate Duplicate Shaders. This will make it easier to fix your textures as shaders that use the same image map are consolidated and duplicates are jettisoned. Now you can open the shaders by domain and look to see if you're missing alpha maps or bump maps. If you are, they will be located in Runtime--> Textures--> Traffikar and then the appropriate folder or Teardrop, etc. I always sort of felt runtimes were kind of an overly complicated way of doing things. The models are .obj or object files. They can contain shading domains and material files. How a normal .obj does this is that the .obj model, material file and any image maps are all in the same folder structure. 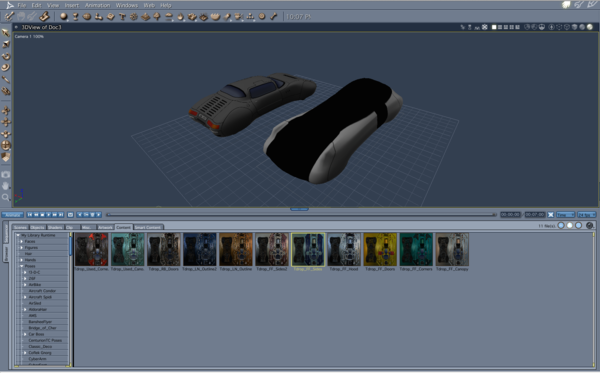 A Poser runtime has the .obj file at the top level of the runtime in the geometry folder, and the image maps in the textures folder, also at the top level of the runtime. 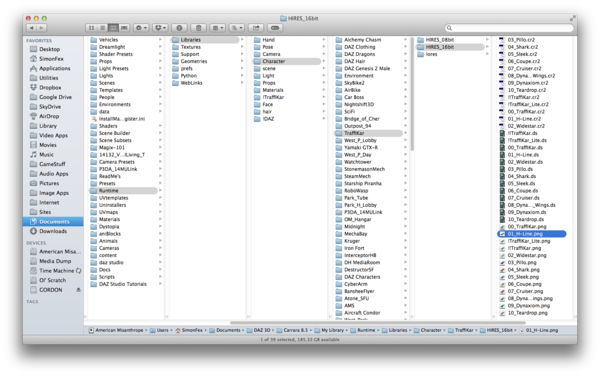 The other folder at the top level is the Library folder, with many different sub-folders for Characters, Poses, etc. These sub-folders are what is displayed in the Content Browser in Carrara. So to load a character or figure you'd select that heading in the Content Browser. A figure or character is generally a rigged object. Props are generally not rigged for movement. So a building, car or even hair can fall under the figure or character category. Ironically, mat files, which change textures, are accessed through the Pose directory of a runtime. This is where you should look to load your different looks for the vehicle. You should load the Poser versions. If you want to load the .ds versions, you may need to open the car in DAZ Studio and use the .duf option to save it for use in Carrara. I can't help with that, as I'm using C7.2 Pro and can't load .duf files. Dart may very well be hitting the nail on the head layering the texture maps and stuff. I didn't think Poser 5 (which is the Poser version that is mentioned in the store) would be that complicated. Even if the mats load, you may have some shader voodoo to do, that Dart describes. BTW, if the cars you need are futuristic, then go ahead with these, but if you need more contemporary low res vehicles, Carrara's native content has some. Some are better than others, but even the not-so-good ones are good for distance shots. This product comes with Daz Studio and Poser options,. so, I think the easiest way to get up and running is to use the Poser versions, rather than the daz Studio duf's which are currntly giving you the issues with shaders. you should have a Daz Runtime library, you'll find the models and poses in there. Hi Andy! Thanks for posting. It helps if somebody actually has the product! All Dart and I could do was make educated guesses! Did you have to do anything with the shaders or did they load properly? I actually got so intrigued (and frustrated) I went and bought it,. (30 days to decide if I'll keep it) .... eh,..probably , maybe,.. nah. The Poser versions load right into carrara. no fussing about. The image I posted is the Poser 6 version,.. no shader adjustments,.. I just added an infinite plane with my Tarmac and puddles shader. and a sky. But,.. I'm sure it could look better with a few tweaks to the shaders in Carrara. I'll have a look at the DS versions later to see what can be done to get those loaded easier, but the poser versions work and It's the same thing. TRhanks Andy! That tarmac and puddle shader looks great by the way! I'm really interested to see how those Poser shaders load in - how the blends occur. Looks cool - and I love that tarmac/puddles shader! Wow! Yes I agree, all you guys are red hot support... unfortunately I don't have TraffKop, just TraffiKar, and none of those models have ever loaded without problems... plus I don't have any sub-directories like yours 3Dage, i.e., "DS and Poser" and/or "Poser 7+". All I have is TraffiKar, and subdirectories of HIRES_08bit, HIRES_16bit, and lores. This is in the Figures directory, btw, and I have nothing for TraffiKar in the Props directory. And so the same problem persists... 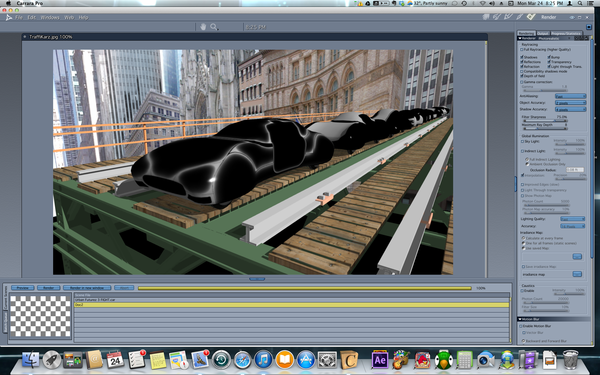 I just get gray, black, and white blobs of cars... The first pic shows just that. I dragged first the default "TraffiKar" from the far right of the browser into the scene, and then the "Teardrop" model from the far left. And it just keeps getting weirder. Inexplicably now, the TraffiKar shows some details where it never had before, while the Teardrop stays to its blobby state. I can't help but think the "TraffiKar" is some kind of base model that you can then inject morphs into and apply mats and such to get the other styles of cars... but then... if that were the case, why would they include all these other car shapes in the content browser, just to have them *not* work. (In Carrara anyway, I understand it wasn't really made for Carrara in the first place). So I headed to the Pose directory, and started slapping mats on a couple of cars, er, kars... You can tell what I dragged onto the models as I left them highlighted for the grabs. Anyway, all that did was make the default TraffiKar worse, and didn't make much of an improvement on the Teardrop one. Also I found this link -> http://docs.daz3d.com/doku.php/public/read_me/index/9276/start - but again I'm afraid I'd have to have you guys "translate" this for me in terms of how it would apply to Carrara's workflow. And on that page are both the pdf manuals for Poser and Daz.... I have to admit after 3Dage's effortless work, I feel *extra* dim :-/ But also, continuing thanks for the hard work guys! Due to the material settings used, the TraffiKars may not display correctly in the preview window. They will appear correctly when rendered. So, it would appear that even DS users may experience some issues with these materials but they should show correctly in the render. but not in Carrara,. .... we'll deal with that shortly. You're right in thinking that there's only one Model (traffikar) which has a bunch of morphs to change the shape into the other vehicles. (Sedan / Razor / Teardrop) . The icons to load these models should be in the (Figures) section of your content, and the icons for the Materials and Morphs should be located in the (Poses) section. * (I'm not a Mac user, so I'm not sure of the correct daz library location on mac) perhaps Evilproducer can help there. In carrara,. 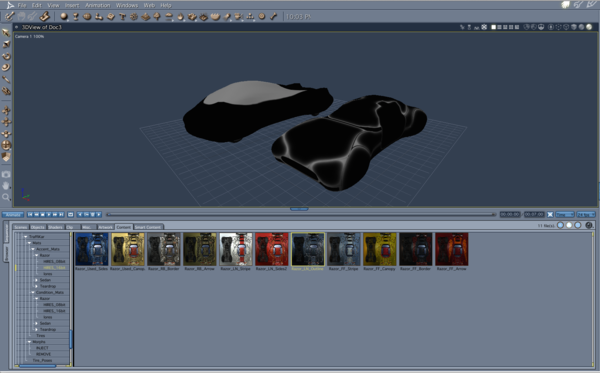 You'll need to load the model, then select the main model in the Scene "instance list" on the right hand side, (see pic) then go to the Shader tab at the top, to edit the shaders. Select the Diffuse channel in the shader list, and then you should see the "texture map" slot. 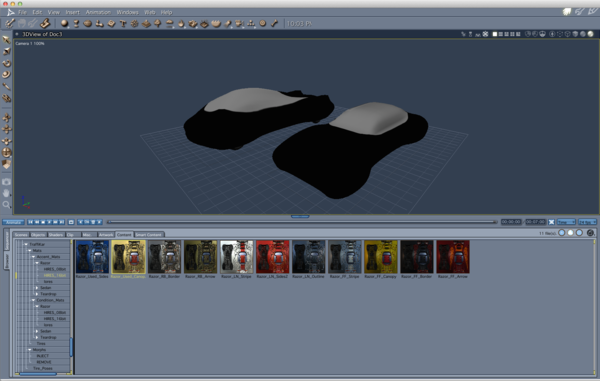 ..Click the little folder to browse to your Traffikar folder, and load the texture you want. I'd encourage you to explore the shaders in carrara, try different texture maps or values in different channels, such as the Highlight / shininess and bump. The reflection in carrara can be set to a value, something like 20 should be fine for a car, perhaps 40 for showroom condition. I've included a couple of shader tests / examples, ..those should load the texture maps and give you a rough idea of what to adjust. NOTE : From the documentation centre. 1./ Materials for TraffiKar have been optimized to allow the user flexibility in choosing any body color inside the Materials Room. 2./ A selection of Accent mattes are available for each of the three designs, Razor, Sedan, Teardrop. 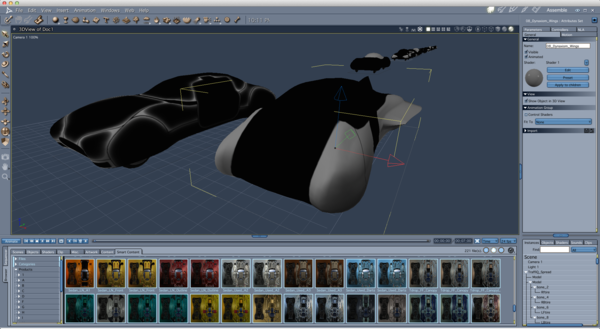 what this means is that there are a bunch of black and white (grey-scale) images, which can be used as a mask, or a blender to combine or mix together, different Texture maps, or Colours set by the user. One of those mixer slots could be a texture map, one could be a colour, and the Blender could be one of the greyscale "Accent" or "Condition" maps for the traffikar model. you could spend hours,. mixing different combinations together. The next time you load the Traffikar, ...go to your shaders and drag the shader you just saved, back onto the Global shader for the model. 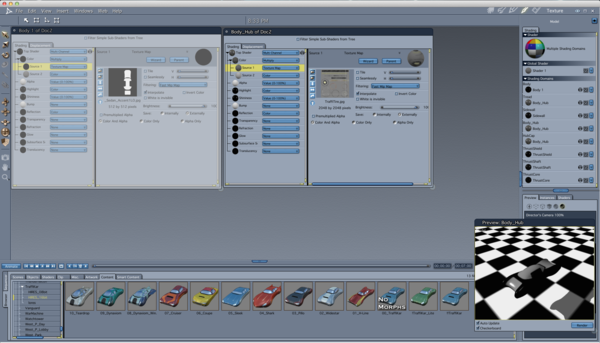 that will replace all the individual shaders on the model, with the ones from your shader.